In April 2012 I took up residence in August Art, a gallery on Shoreditch High Street. I had initially researched some history of the area which investigated the Huguenot silk trade and lace-making, and visited the national archives at Kew to look at Huguenot silk and lace samples. 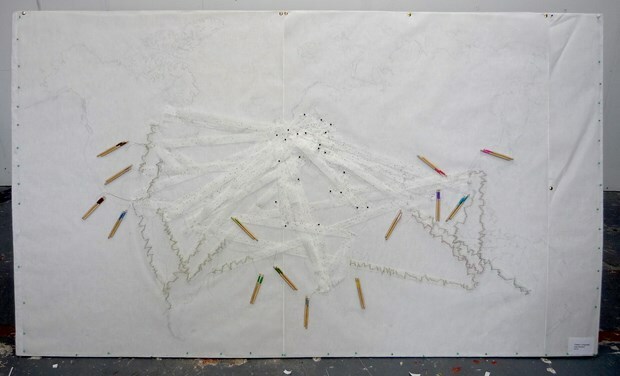 I wanted to explore ways of re-translating the patterns made in previous works, Confabulation and Aurophone, using the idea of lace-making which I had used in a previous work for an exhibition in 2008. In design, a pattern language is applied to some complex activity other than communication. In the same way that language provides a structure for communication, pattern language provides a series of structures for design. I used these ideas to develop a new work, Pattern Language, that plays with the idea of language, communication, translation and migration. 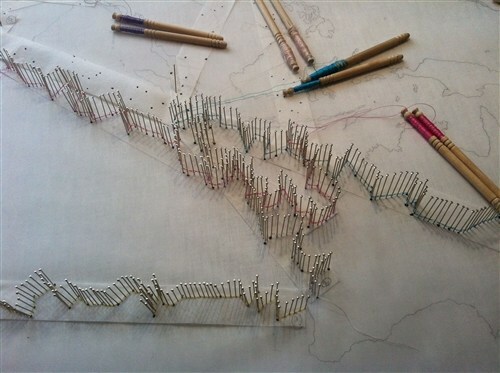 In this combined map/lace work, the routes of individual migrant histories are plotted using the patterns generated by the Aurophone, and as they cross and interweave new patterns are formed. 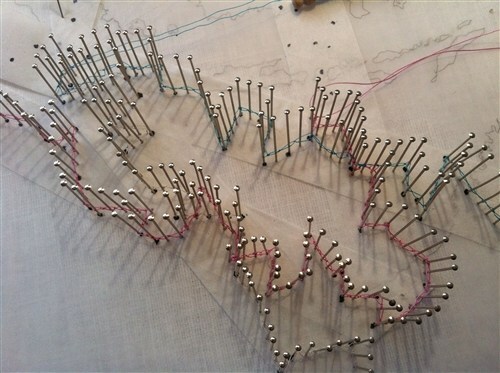 The physical process of making the work is painstaking and time-consuming, involving hundreds of tiny knots. 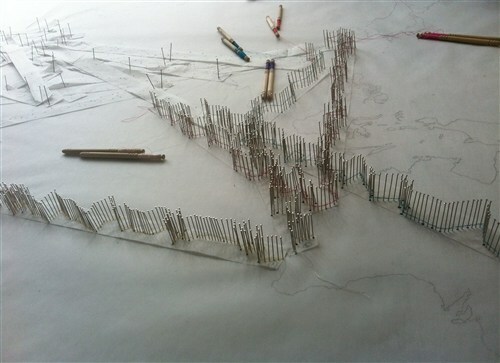 As I made the work I thought about memory processes, and the use of knotting in many societies as a way to 'tally' memory, to exteriorise and make physical a mnemonic aid, so that as the 'narratives' grew on the table I was literally and metaphorically weaving a story onto the map. Meanwhile, recording oral histories of travel brought me to thinking about how in the telling of narratives, each time a story is told it is re-translated, altered slightly, for audience, context, and as words are passed down and lost or changed. The act of creating the lace drew on anthropological readings of different traditional methods of remembering ancestors and lineages, from the celebrated Inka khipu, a series of knotted cords, to the Kandingei of Papua New Guinea:?“Among the people of Kandingei, on the Middle Sepik River, Papua New Guinea, the most important man in every group keeps a knotted cord – some six to eight metres long and three centimetres thick – which is said to represent the primal migration in which the founder of the clan, following in the path of a crocodile, journeyed from place to place” (Ingold) ? 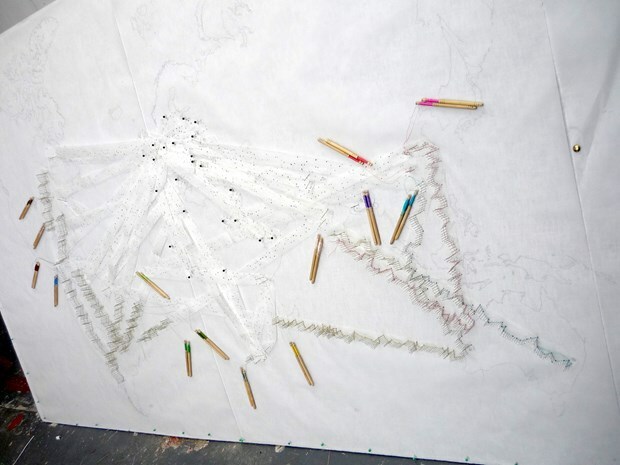 The process of lace-making also involves the transferral of traces into threads, so that surfaces are brought into being, and the pattern is eventually discarded leaving only the threads. In this interpretation the lines on a map become free flowing threads, interlinking and independent of boundaries or invented divisions between state, region, religion or nationality. This reflects the act of migration, of travelling, not as a transitional activity but as a way of being, and of place not as a full stop but rather as a knot of entangled lifelines. The act of migration being a liminal state, the migrant is a “passenger”...“betwixt and between the positions assigned and arranged by law, custom, convention and ceremonial.” (Turner) Therefore, “the life of a person is the sum of his tracks, the total inscription of his movements, something that can be traced out along the ground”(Ingold) - the travelling defines the traveller, and the act of way-faring becomes an act of place-making. ? This relationship between the physical and the oral recording and translating of memory seems to meet at the point of a 'pattern language', finding ways to decode, translate and understand a structure of how we tell and understand memory of place.